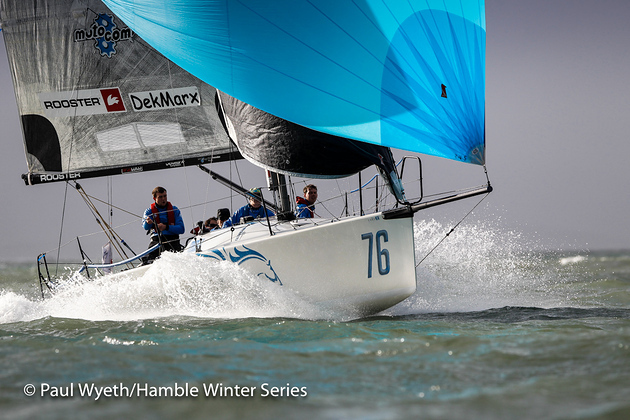 After last week's brief return of the Beast from the East, the forecast for Week 8 of the HYS Hamble Winter Series 2018, was for 12-30 knots WSW, with low water in the Solent at 12.30 pm. "Quite interesting conditions!" as PRO Kathy Smalley put it, or, as one competitor was heard to mumble "A witch from the West!" There were two options to find a decent opening beat, move the Bramble Bank or head south of the bank to Goodall Roofing (4W) which is where the CB took up station. The windward destination would be Prince Consort, followed by a "sheltered" broad reach to Norris to keep the first boats round the windward mark away from those still approaching it. A sort of health and safety spreader leg if you like. There were one or two interesting happenings around start time. In Class 3, With Alacrity, with one reef in the main, lost a batten during the start. Skipper Chris Choules declared" That's that for the day!" but Vanessa and the crew were made of sterner stuff, probably because they don't have to pay for the repairs! They lashed two spare battens together; whilst heading to the windward mark under No 2 only, and had the main back up for leg two of the course .The spirit of Baden Powell was alive and well. 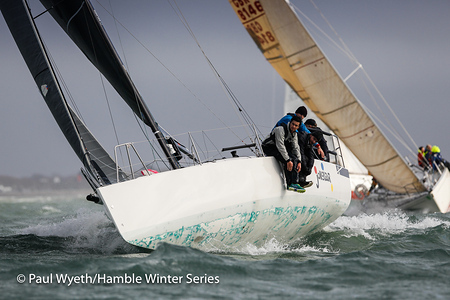 Despite the main threatening to come out of the mast track a couple of times, they saw off the other three Sigma 38s, Pavlova 111, Max Walker, Light, Richard Kern and Vitesse, Jon England, to take second place for the day, behind J'ronimo,J92, David Greenhalgh. John Noe's La Nef 1V having taken a very tentative approach up the first beat then changed up a gear and was only a couple of minutes behind the Sigma's at the end. They had "a slightly dodgy moment on the finish line," when they arrived on starboard to the disgust of a port tack J109 who had to dive behind their transom to finish. 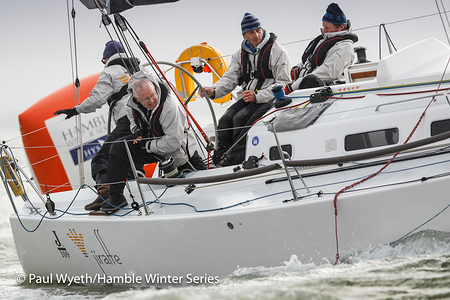 The holder of the youngest recorded crew member in the 2018 HYS Hamble Winter Series, Malice, Mike Moxely, decided to get their broach out of the way before the start. They subsequently found a bit of a wrap on their first hoist, but then had a very good day storming into the lead and first place by the finish. Their slightly older regular tactician Huw, had returned for Race 12. Behind Malice was the ongoing battle between the J 109's of Simon Perry and Mike and Susie Yates. 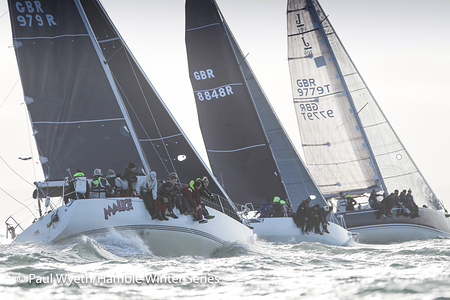 Simon Perry, Jiraffe, commented that Mike Yates, Jago, was "Quite good at match racing today!" This was probably because Jago, second, beat Jiraffe, third, on the water and, unless Jiraffe did something really silly, they had the series sewn up. Jago had 14 year old Cameron Yates on the mainsheet on Sunday, as he has been all series. A new record? His Dad Mike fell on the wheel during the race and bent it, but don't worry Susie is getting him a new one for Christmas. There was a return to the War of the Roses, when Chaz Ivill (Red) and Rob Bottomley (White), turned out for the Class 1 showdown. It was Davanti Tyres, J112e, Chaz Ivill and Paul Heys, who were cooking their Hotpot with gas however, taking their fourth win of the series. Sailplane, First 40, Rob Bottomley could only manage third place behind Malcolm Wootton's, Pegasus DekMarx. 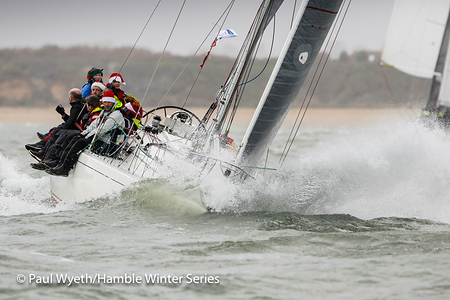 You can check out Pegasus planing on FB @HambleWinterSeries. Seven little boats turned out in Class 4. Series leader Stan the Boat, Toby Gorman, was not one of them, as he had the series in the bag already. This did not stop the rest having fun and Protis, Catrina Southworth, revelled in the windy conditions to win on the water and by six minutes corrected. If this had been the modern Quarter Ton Cup they would not have been allowed to race in Sunday's wind conditions! In second place came M'Enfin!? Skippered this week, on her own, by Sophie Chudziak. Bertrand was back in France. Avec les gilets jaunes? Peut-être pas! Bernard Fyans Erik the Red was third. Barney Smith, Imptish, reported, "Plenty of fun down wind. Red boats and white boats were seen to show their keels and one white boat was seen on its side pointing at those rocky bits to the East of Cowes." Clearly there is honour amongst Impalas, Barney not wishing to name names. He concluded "Protis were awesome; at least I think they were as no one ever sees them after the start!" A number of competitors were impressed by those two club stalwarts, Rupert Smalley and Peter Baines, who manned the pin end boat, Obsession, as it bounced up and down during the windy start sequence. Rupert had a slightly different view "It was nice and flat until all those race boats started to thrash around." He also felt it would be better if crews did not "ping" the pin end mark until it had actually been laid. There's experience for you. Back in the HRSC Clubhouse, Paul Heys of Key Yachting presented the day prizes. He managed to avoid one awkward moment by quickly passing the Champagne and chocolates for Class 1 to Chaz Ivill. The Series prizes were presented by Lee Pollock of Hamble Yacht Services. Simon Perry with Jiraffe won Yacht of the Series. He thanked the Race Team and volunteers: "It was a fantastic series" he said, "and we will definitely be back again next year."